Most agencies target marketing managers in order to stay in the running for RFIs. OLIVER is different. They install and operate full-service, on-site agencies. This requires a significant financial investment, internal structural changes, as well as a great deal of trust. This means their target buyer is more likely to be a CMO or CEO. I repositioned OLIVER’s content in Spring 2015 to appeal to this hard-to-reach, time-poor audience, achieving a marked increase in measurable lead generation. Based on original research, conducted in collaboration with two third-party businesses. I operated as creative director, project manager & copy editor, leading a designer and copywriter through the project. In two months the white paper was downloaded 1700 times, generating over 20 SQLs. To drive traffic to the report, I wrote these ads for both organic and paid social media. The first one scored over 4% CTR on LinkedIn. Click the images to read. 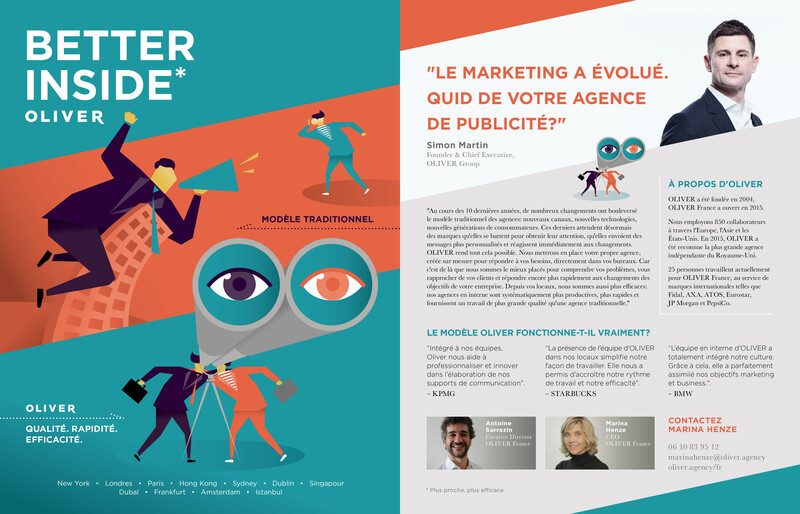 This ad was printed in a French magazine, targeted at brand marketers interested in the agency landscape. I wrote the copy and directed a designer on this project. I wrote this on behalf of one of OLIVER’s business directors, to support the business’s move into the tech space. Target audience: CEOs at Fortune 500 firms.